The Exercise Ball Chair – A Great Idea Or Just Another Gimmick? The Exercise Ball Chair - A Great Idea For Your Back Or Just Another Gimmick? Exercise ball chairs are a new trend for keeping your back healthy while sitting behind your desk. But do they actually work? Now as someone with a bad back you may have used an exercise or balance ball before, on a physio visit or at your local gym. And they can be really helpful for keeping your back pain at bay. Because they're great at working and strengthening your deep-lying core muscles and improving your balance. Which provides your back with the support it needs while also reducing muscle strain and tension by keeping your body balanced so that pressure is spread evenly. So if you could also gain these benefits while sitting behind your desk that'd be a great thing right? Because sitting down for a couple of hours or more each day can spell big trouble for your back. And this is a big problem for many people in the modern world as lots of us are forced to do this as part of our job. Which is how the concept of the exercise ball chair was conceived. As by practicing active sitting rather dormant sitting you keep your core muscles active and can prevent them from weakening. So your back will remain better supported. And by constantly having to work to keep yourself balanced and upright on the ball you can develop a healthy sitting posture too. Which will also help to relieve the pressure and strain associated with sitting. So it all sounds pretty good right? But the big question is, do they actually work? Before I go through the pros and cons of using an exercise ball chair, you may be curious to know what's available. Now there are a few popular chairs on the market such as the Gaiam Classic Balance Ball Chair and the Luxfit Exercise Ball Chair. And they all do a decent job. 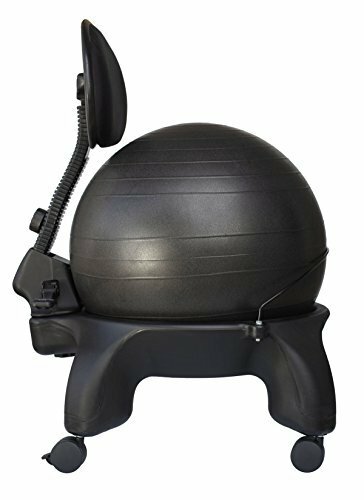 But my choice would be the Isokinetics Exercise Ball Chair, as this one has a few features that puts it ahead of the rest. Firstly it has a 'tall boy' ​base which means it can accommodate people a couple of inches taller than most other exercise ball chairs can. However this still has a maximum height limit of 6' 1" so it's no good if you're taller than that. It also comes with a back rest that you can adjust the height of, which is quite unique among these types of chairs and means you can position it at the perfect position for you. The exercise ball itself is very sturdy and durable, and able to handle a maximum weight limit of 300lbs. And it comes with everything you need to get started such as a pump, assembly instructions, and even an exercise guide. So if exercise ball chairs have piqued your interest so far, you could do far worse than giving this one a go. Why Does Sitting Cause Back Pain? So now that you know which exercise ball chairs are out there, let's take a look at why you might need one. As prolonged periods of sitting can be so bad for the health of your back. And if you have to sit down for a few hours each day, then unfortunately you are at risk of developing lower back pain. Keep your spinal discs healthy to ward off back pain. In between each of the vertebrae in your spine is a spinal disc that is vital for keeping your back healthy and functioning. As they provide your spine with support, help with it's little movements, and absorb the shocks that come as you move around. So it's crucial that you keep your spinal discs healthy if you want a pain-free back. The problem is that to stay healthy these discs need you to be moving around. As when you do this they can expand and contract, which is when they are able to take in the blood, oxygen, and nutrients they need. However when you are sitting down ​your discs become squeezed and compressed. Which means they can't take in what they need to stay healthy, and so they weaken over time. ​And this deterioration is bad news. As it leads to a loss of flexibility in your spine and less support and protection for your back. The muscles in your core and trunk help to support and protect your lower back as you go about your daily business. So one of the best ways to stay pain free is to keep these muscles flexible and strong with regular stretching, strengthening, and exercise. ​However when you are sat down these muscles remain inactive. And if you sit for hours each day this can lead to them weakening and tightening up. Which means​ that your back receives less support and gets put under even more pressure and strain. Leaving you in more pain and discomfort. Many people get into bad habits when it comes to sitting and one of the worst is sitting with a bad posture. And whether that is by slouching, rounding the shoulders, leaning forward, or just perching at an awkward angle, this can be a disaster. As it will add pressure and strain onto your lower back, which is all you need when you're already struggling with compressed vertebrae and weakened core muscles! And it's not just your back that suffers either, as poor posture can also cause you pain in your neck and shoulders too. So you have a great reason to learn how to improve your sitting posture. And this is something that sitting in an exercise ball chair could help you with. So let's begin with the good news and see exactly what the benefits of using an exercise ball chair are for your back. And what you get from using one that you don't get from a regular office chair. The main advantage of using an exercise ball chair over a regular office chair is that your core muscles have to remain active as you use it. This is because you have to engage your core to stay upright and balanced, rather than relying on the back of your chair. And keeping your core muscles engaged and active prevents them from weakening, which keeps your back better supported. ​Your leg muscles will also be working more than they would in a regular chair. And this can stop your hips and hamstrings from tightening up as they can while sitting in a regular chair, which is another big plus for your back. As it reduces the burden and relieves pressure. So great news both in and out of the chair. You don't need to go to spirit level extremes here! Actually maybe that title is a bit misleading, because the first time you try and sit on an exercise ball chair it will probably feel strange and awkward. As your muscles will have to work harder to hold you upright, which they definitely won't like to start with. But at the same time it will encourage you to sit up straight eventually. And this makes slouching impossible, so helps to keep your spine in proper alignment. However, be careful not to sit up too straight, as doing so can also add pressure onto your lower back. Instead aim to maintain a healthy 'S' shaped curve in your spine as you sit. Another positive of your body having to constantly work to stay upright on your exercise ball chair is that it will improve your overall balance. As all that practice you get every day will retrain your muscles to keep you more balanced while standing and walking too. And a well balanced body is a healthy one. As the helps to spread pressure evenly across your whole body, rather than forcing your back to take the brunt of it. Your posture will also naturally improve as you get used to sitting up straighter and your core muscles strengthen. And having a good posture is also brilliant for taking the pressure off your lower back and reducing the load placed upon it. Keep your blood circulating to stay healthy. Keeping the blood flowing around your body is vital for keeping muscles, tissues, and organs healthy and functioning. As this is how they get the oxygen and nutrients they need to repair, heal, and stay strong and healthy. However when you are sat down in a traditional chair this can be a problem. Because circulation to your lower limbs gets restricted, which can cause a tightening of the muscles as well as aches and pains. But the good news is that sitting on an exercise ball chair won't restrict your circulation in this way. And this will help to keep the blood circulating as it should. This is because as you are constantly changing positions as you sit, your muscles are staying active. And this will help you to keep back pain to a minimum. Burning a few extra calories as you sit is always going to be a bonus right? ​Well one study found that sitting on an exercise ball will do just that. As when they compared office workers sitting on normal chairs to those sitting on an exercise ball, they found that those on the latter were burning an extra 4 calories per hour. Which granted doesn't sound like a lot, but it all adds up over the weeks and months. And these findings were just for static sitting. And seeing you'll have the tendency to bounce and move about more on an exercise ball chair, the actual calories burnt will probably be higher than this in reality. So it's one good reason to feel less guilty about eating that donut for elevenses! You Can Bounce On Your Chair! These things were fun right? Ok, time to talk about my favourite benefit of using an exercise ball chair now. Which is that it's fun! As it can bring out the child in you as you're reminded of happy memories of bouncy castles, space hoppers, and freedom from responsibility. And you'll find that the temptation to bounce on your chair regularly during the day will be too strong to resist. Which is a great thing. ​As not only is it a good way to keep your muscles active and engaged. It's also a great way to relieve stress and tension. And it can also help you to get the blood circulating to your legs and burn a few more calories too. So don't be frightened to release your inner child when you're sat on your exercise ball chair, as it's good for both your body and soul. A good ergonomic chair is a great way to keep your back healthy when sitting. This is because they are fully adjustable,pressure relieving, supportive, comfortable, and make maintaining a healthy sitting posture so much easier. However they don't come cheap. In fact they can put a serious dent in even the healthiest of budgets. So if you want to try a cheaper alternative then an exercise ball chair could work out well for you. Now these chairs are obviously missing many of the benefits of the ergonomic chairs. However, if you do start to feel the benefits of your new exercise ball chair and the fact you've saved yourself a few dollars, don't be overly smug about it. As no-one wants to work next to this guy! So, exercise ball chairs may be sounding pretty good right now after reading through that list of benefits. Because while exercise ball chairs can bring you many benefits they are not going to work for everyone. And they even have their critics that argue they are not actually helpful for your back at all. So let me run through some of the downsides of using an exercise ball chair. When you try and fix your sitting posture it can be really difficult and uncomfortable. This is because your body gets so used to sitting in a slouched and unhealthy posture that when you straighten yourself up it can feel really weird at first. And this effect is magnified when using an exercise ball chair. Because not only are you changing your posture, you are also going from sitting in a chair with relaxed muscles to an active form of sitting. So your first few attempts at sitting on an exercise ball will probably feel very awkward. And you probably won't be able to maintain it for very long either. But over time your body and muscles will strengthen and adjust and it will get easier. ​So build up slowly and before you know it you could be sitting comfortably for hours in an exercise ball chair. Active sitting is great for keeping your muscles strong and healthy as you sit. But the downside to this is that they never get to rest and relax. So you may find yourself needing to take a rest from your exercise ball chair to get up and give your muscles a break for a few minutes every hour. While sitting on an exercise ball chair can prevent your core muscles from weakening and improve your sitting posture, it can't do anything about your compressed vertebrae. As these will be compressed no matter what you are sitting on. So you will still get the same problems from this as you would do on a regular office chair. Unfortunately you can't do this in an exercise ball chair. Sometimes while sitting you just need to switch off for 5 minutes and relax. As this is a great way of releasing any stress and tension that has built up. And ergonomic office chairs are great for this, as most have a tilt mechanism that allows you to recline backwards. As changing the sitting angle to a reclined one like this helps to take the pressure off your lower back and relax your body. However try leaning back on an exercise ball chair and you'll be on the floor! So you can forget about relaxing on one of these. No support for your arms. The lack of armrests on an exercise ball chair is a major area where they are lacking compared to most office chairs. And this is important, because armrests take the pressure and strain off your shoulders as you sit. Which also lessens the tension in your neck and upper spine, allowing your upper body to stay more relaxed. So when you are sitting in one of these armless chairs, your shoulders are working harder than they need to be, and don't get a chance to relax. Which can lead to muscle fatigue, cramps, and pain in your upper body and arms. Is your exercise ball chair the right height for your workstation? Not being able to adjust the seat height is a big problem when you are trying to sit with a good posture on an exercise ball chairs. Because being able to adjust the height of the chair you are sitting on is vital for getting your sitting posture and desk ergonomics right. As firstly you need to match your chair height with the height of the desk you are using. And if that desk isn't adjustable you may find that you are sitting too low beneath it, which throws your posture out of sync. Secondly you need to get your angles right to sit correctly. So to remain healthy and keep the pressure evenly distributed, your hips and knees should be at a 90 degree angle, while your feet remain firmly planted on the floor. This is where ergonomic office chairs come into their own, as you adjust them to fit your height and desk set-up like a glove. Unfortunately you can't do this with an exercise ball chair. The lack of height adjustment also means that exercise ball chairs are not really suitable for taller people. In general the maximum recommended height​ for users is 5' 9", although the one I recommend in this article is a taller one and allows for heights of up to 6' 1". So if you're over 6' tall then it may be impossible to sit in a healthy posture on an exercise ball chair. They May Even Cause Spinal Shrinkage! Spinal shrinkage sounds pretty nasty and that's because it is. It basically means a decrease in the height of your spinal discs and a narrowing of the spinal cord. And this can lead to all sorts of nerve pain, sciatica, numbness, and muscle weakness. Now regular prolonged sitting over a period of time has been found to cause spinal shrinkage in some people. And this occurs because the increased load on the lower back and compressed spinal discs when sitting leads to these discs weakening and shrinking. However one study found that people were at greater risk of developing spinal shrinkage by using an exercise ball chair than a regular office chair. As while your muscles remain active and strong while sitting, the extra load on your lower back could cause you problems over time. Now this is a very small risk as these balls are made to withstand the pressures of people up to 300lbs sitting on them every day. But occasionally they do still pop unexpectedly as you can see in the video above. And while this may be comical for your family, co-workers, or thousands of YouTube viewers, it can be dangerous for you. As hitting your head on the floor or desk as you fall could have serious consequences. So while this a rare occurrence with exercise ball chairs, it's still something worth thinking about. The worst pain in the world! Now this one will only affect 50% of the market but it can be a big problem for us men. Because just like a camel ride or a cross-country mountain bike route, what seemed like a good idea at the time can rapidly turn into a very uncomfortable one. As the plain truth is that some men may not like the sensation of sitting on an exercise ball chair because they can be hard going on your nuts! Because it's no good replacing the pain in your back with pain in your balls! So What's The Overall Verdict? So now to the big question. Are exercise ball chairs as good for your back as the manufacturers say they are, or are they just another gimmicky back pain fad? Because they make sense in theory, as exercise and stability balls can be great for your back. And for that reason they have been used for a long time by physios to help their patients rehabilitate after injury by re-establishing their core strength and balance. And they are also commonly used for fitness and conditioning in gyms, as well as in yoga and pilates classes. So if sitting on an exercise ball chair rather than a regular chair during the day would keep your core strong it would be a great idea right? Well according to the scientific research that has been done so far on this topic it remains debatable. Now there are many stories from people who say that switching to an exercise ball chair worked wonders for their back pain. For instance one such case study found that an office worker greatly reduced their back and neck pain by doing this, and when they tried to go back to an office chair a few years later their pain returned. However other research argues that the negative effects of using an exercise ball chair outweigh any of the possible benefits. For example, it was found that although muscle activation was increased by using an exercise ball chair, the participants also experienced more discomfort afterwards. Which may be from their muscles being fatigued or overworked from being constantly active. And others complain about the lack of safety, as there is more chance of falling off one than with a regular chair. ​So the answer isn't clear cut. However for me personally, exercise ball chairs are no match for a high quality ergonomic office chair. This is because ergonomic chairs can be adjusted to fit any individual and workstation, offer great lumbar support and protection, and have excellent pressure relieving features. Whereas the exercise ball chair won't fit everyone and may make sitting in the ideal posture difficult. Also your muscles never get a chance to relax, which can make you tired and fatigued. So in my opinion, a mix of using an ergonomic chair along with taking regular microbreaks to stretch and mobilise your body is the best option for office workers to get rid of back pain. But that's not to say that exercise ball chairs aren't worthwhile. And the big advantage to them over ergonomic chairs is that they are a hell of a lot cheaper. So maybe another answer is to use them both. As an exercise ball chair could be really beneficial as something you use for an hour or two each day alongside your ergonomic office chair. Because by alternating like this your muscles are getting the activity to prevent them from weakening, but they also get a chance to rest and relax at times too. So while I don't think exercise ball chairs are the answer, they are still useful and worth trying out. And definitely not a gimmick. So if you're interested try one for yourself (such as the Isokinetics Exercise Ball Chair) and see what you think, as it could make a big difference to your workday experience.